I love gardening, learning gardening techniques and designs, and photographing and painting plants. Member of Royal Horticultural Society. 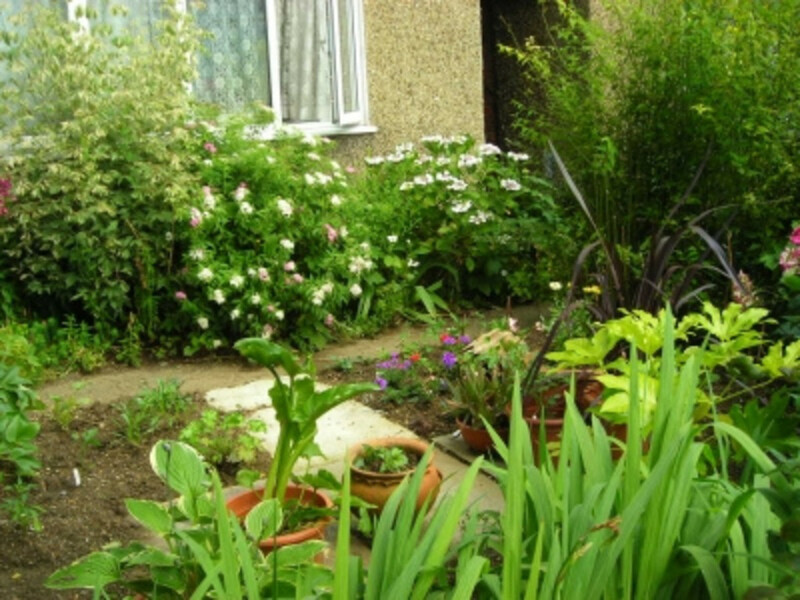 When I asked professional landscape gardeners about giving my front garden a makeover, they said it would cost about £2,000 ($3,337). What I really wanted was just a modest bit of paving to replace an awful grassed area that was looking parched and weedy, and then a profusion of flowers like an old-fashioned cottage garden. I did it for £225. They laughed at me and said it would look awful, but I decided to go it alone, and in the end, they swallowed their words and agreed it looked quite pretty. Lots of passers-by who are complete strangers stop and say how lovely my garden looks when they see me working on it, and it makes me feel quite proud. 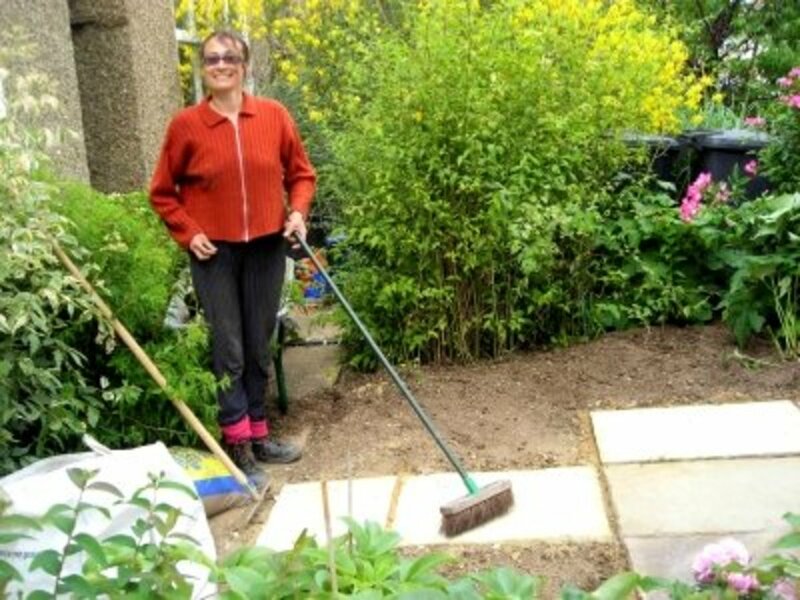 It was actually fairly straightforward to do , and as it would be easy to copy, I am showing you how it progressed so that you can give your garden a cheap makeover too. 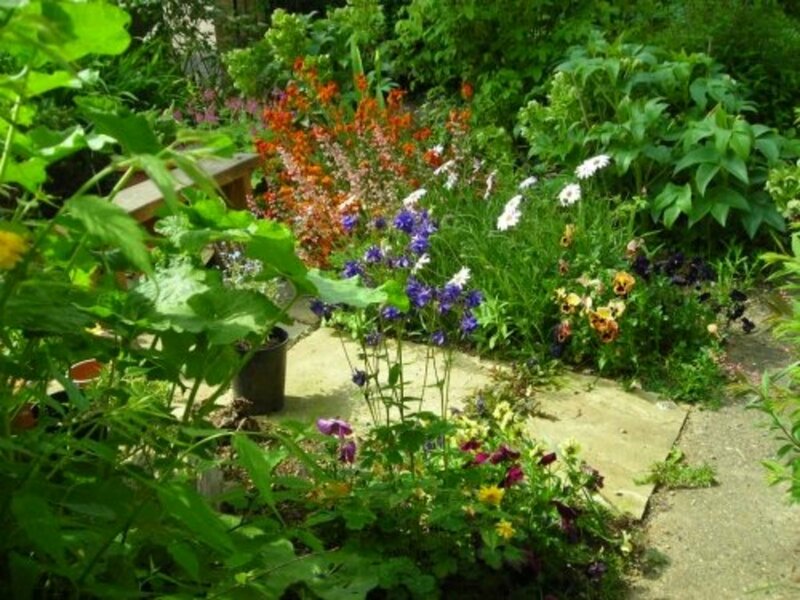 It's not rocket science, and the description below will give you the confidence to make a few changes to your own garden, without resorting to expensive landscape gardening. I decided to retain all of the well-established shrubs in the borders—some because they were too difficult to remove and others because they were really quite nice and just needed to be thinned out. 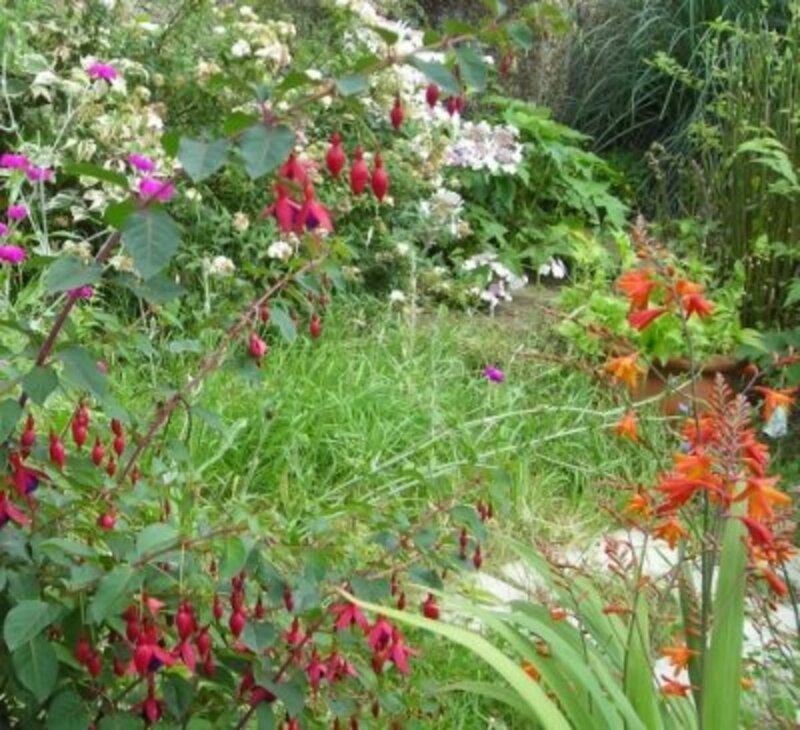 My reasoning was that it would take a few months for the new part to come into fruition, and therefore, it was best to go with the swim and keep the plants I knew were successful as I could always remove them later if they didn't fit in with the new order. I needed to work out how many paving stones I would need and sort out the soil. I went to the local garden centre and chose a few of the rectangular paving stones I wanted, and took them home so that I could lay them out and get an idea of how many I would need and what it would look like. I then went back and bought the rest of what I needed. The paving stones cost £35 ($58). I started digging up the turf, and it was such hard work that I got someone in to help me (there she is in the photo above). I was advised to get some good topsoil to replace the nutrient-depleted apology for soil that was there, and, in addition, to cover the area with manure. This was delivered by lorry and cost about £100 ($168). 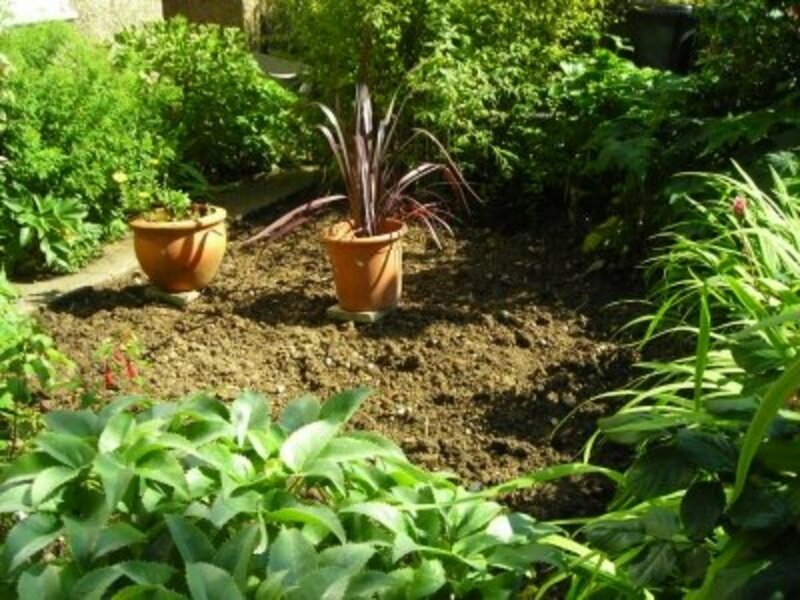 It was necessary because London (where I live) was built on clay, and the existing clay soil in my garden had not been fed or nourished since the house was built in 1935. I was told that the paving stones would need to be concreted in, but I felt this was unnecessary. So we merely laid a bit of rubble and earth down, and set the paving stones on top. I wanted spaces so that I could grow small plants in the cracks. It's now a few years down the line, and we've never had problems due to lack of concrete. Total Cost: £135 ($225) instead of £2,000 ($3,337), plus the cost of a few plants (some grown from seed). 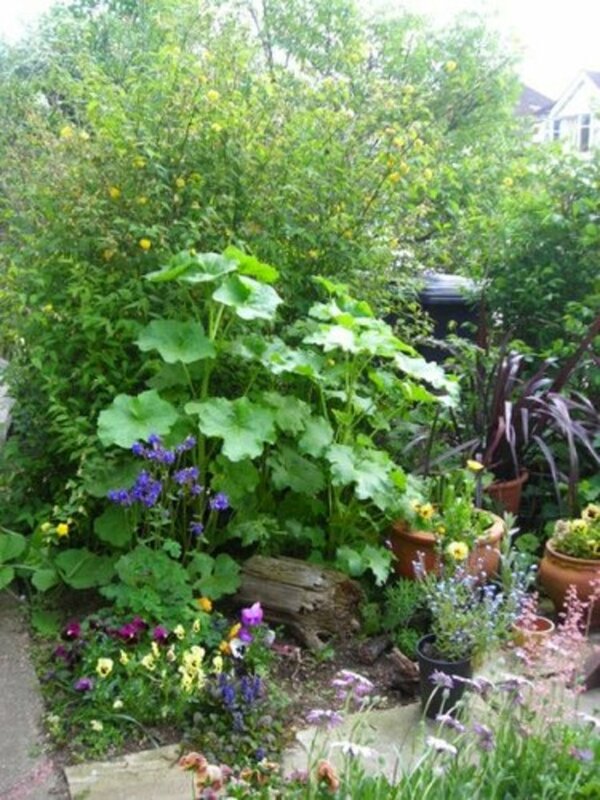 Standing on the path leading to my front door, I could see that it was no good planting tall plants in the middle of the garden because they would hide the smaller plants behind them, and would also conceal the view of plants from the road and from my windows. 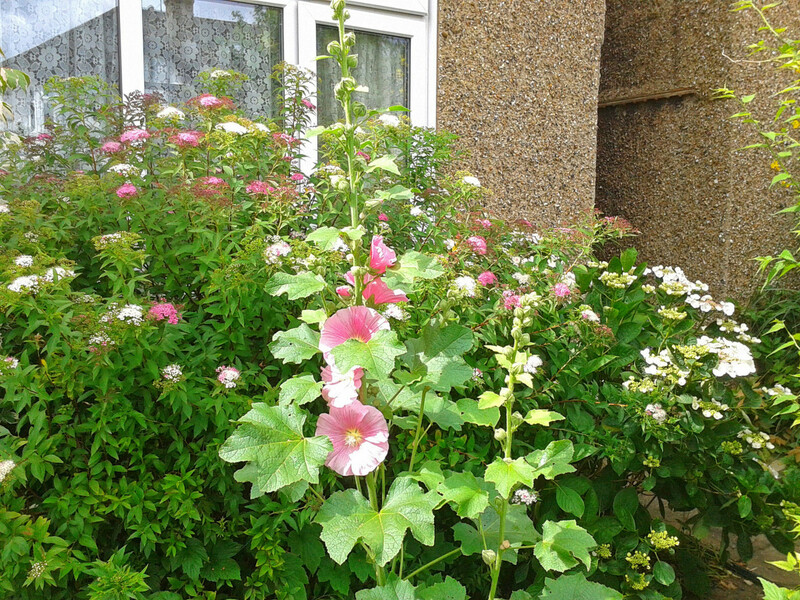 I planted the tall ones at the far side - hollyhocks which take quite a long time to grow tall, and don't flower till mid summer. I put in several shorter plants in front of them. I had intended to put in low bedding plants for a short period and then put in mid-height plants, but in fact the low bedding plants looked so pretty and effective that I decided not to put in any more bigger plants. 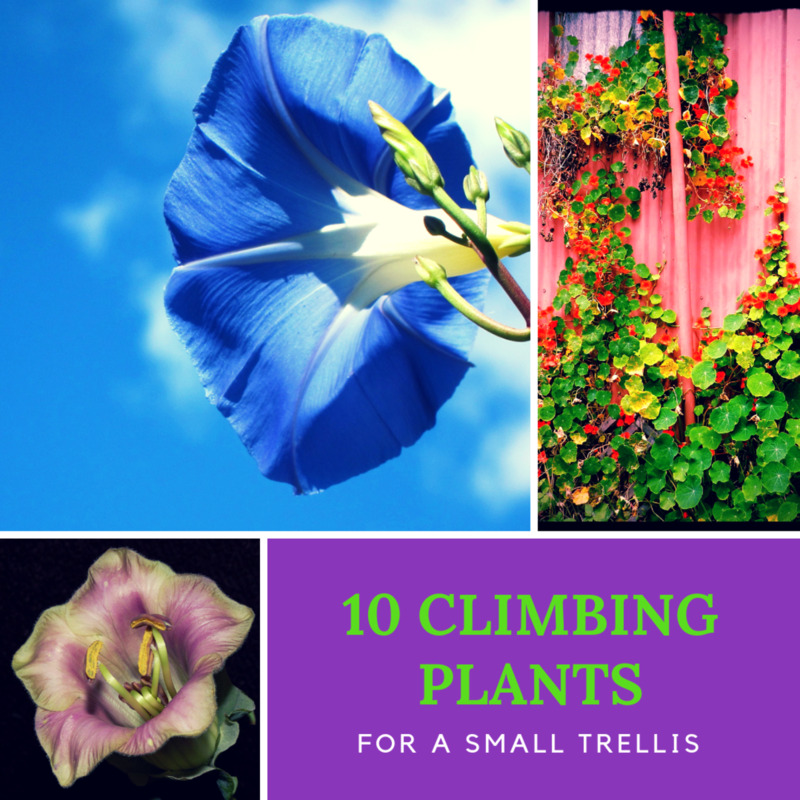 So I had lavender, pansies, osteospermum (Cape Daisy), wild geranium, verbena. adjuga, heuchera, forget-me-nots and aquilegia (columbine) - all colour-toning. My son gave me a roughly made rustic stool to sit on when I was gardening, and this became a permanent feature together with two logs. All the colours had to look good together, and blend with the existing plants. I also planted up a couple of garden pots, one with marigolds and another with a large formium. I was delighted with the result, and, as I said before, even the professionals had to admit it looked good. First I Drew out a Plan of My New Garden—Nothing Special, and Not Very Detailed. The existing garden consisted of flower beds bordering the paths, and some dry, impoverished clay soil with depressing tufts of straggling grass in what could euphemistically be called a lawn, which you can just see in my photo on the left. Well, my grass was to lawn as my house is to Buckingham Palace...I don't think so! My idea was to remove the grassed area completely, lay a pattern of paving stones in the form of a 'T' shape, in order to have easy access to all parts of the flower garden, and then fill the rest of the area with flowers, which I would select according to their height, seasonal variation and growing pattern, colour, ability to flourish in half-shade, somewhat dry because of a tree in the street outside. So in summer it was pink, white, mauve and flashes of orange. In autumn it was more orange, evergreens and fuschia colours. In winter, lots of white berries from pernettya, blue-black berrries on the mahonia and red berries on the cotoneaster and roses. 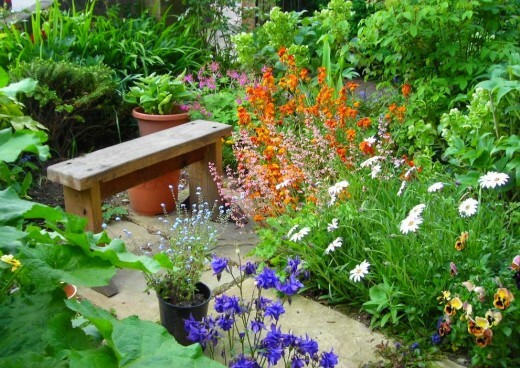 Would you like to design your own garden, or do one like mine? This Design Is So Simple You Could Do It Yourself. You Just Need a Little Bit of Thought to Work out What You Need. 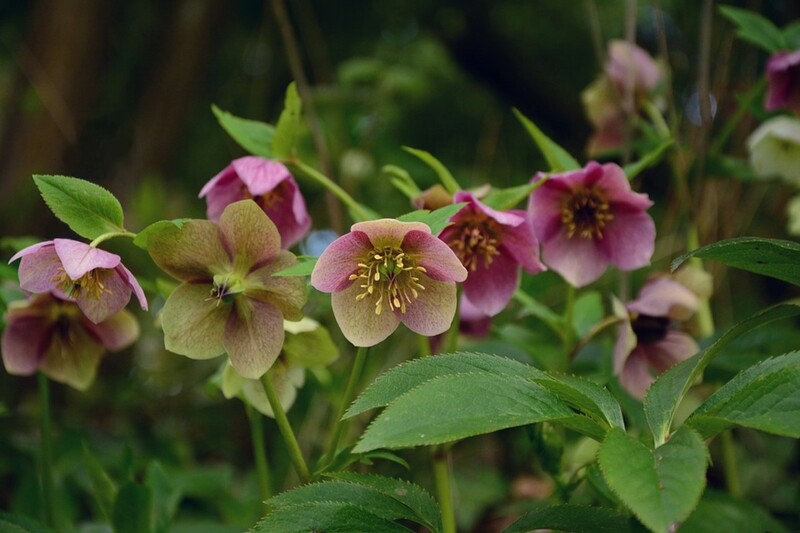 In January the white-green hellebore flowered, followed in early spring by yellow mahonia, yellow and white daffodils and narcissi, then pink bergenia and bluebells and forget-me-nots, bright primroses, then flame coloured wallflowers, almost dazzling in their brightness, and grey-white osteospermum. If you can do even some of these things, it will be perfecto! Looking back on the photos from when I first designed the garden, I'm amazed how much it has changed over the course of time, as rampant plants grabbed too much space, and some hopefuls didn't do so well. I am forever digging out, cutting back and planting new plants, but very much with an eye to maintaining a shape and color scheme which looks pleasing to the eye. great Job! It looks so inviting and relaxing, I love all the colors and shades used. You did a great job! Thank you for the compliment. vIt's amazing how hard I'm prepared to work for nothing nowadays. When I was a solicitor, although I did sometimes work pro bono, I usually charged a substantial hourly fee! Most of my plants are perennials, and then I just plant a few annuals to ring the changes. Your backyard space is beautiful. I read this Hub with keen interest. I have areas that would profit from the kind of installation you did. I wonder how many of your plants are perennials. In Northern California we are experiencing a drought, and all our plans have to be adjusted. Anyways, kudos! I've neglected my garden too! I have to change a big area in the back - I might just go it alone too - things are so expensive here in London! Anyway I love your front garden. Well done! Stunning results. You are an inspiration. I've been so busy writing hubs and blogs, I'm neglecting my garden. Very pretty! I love flower gardening, but it is so much work. That is why I have 5 beds! Is the pink flower a hydrangea? I can't tell from the shot. I love those. Your garden is beautiful and you chose some of my most favorite flowers. 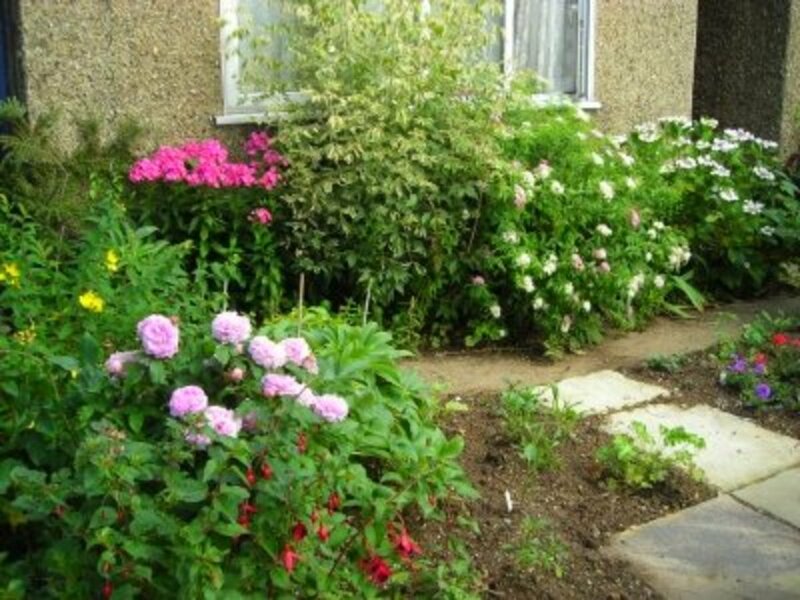 Great work ion this page and your lovely cottage garden. Thanks for sharing. Great lens! We featured it on our NEW Google+ page today!! Check it out! @anitabreeze: : Thank you for your message which will be dealt with as soon as possible. I love doing my own projects! Yours looks great! @Virginia Allain: : Thank you for your message which will be dealt with as soon as possible. 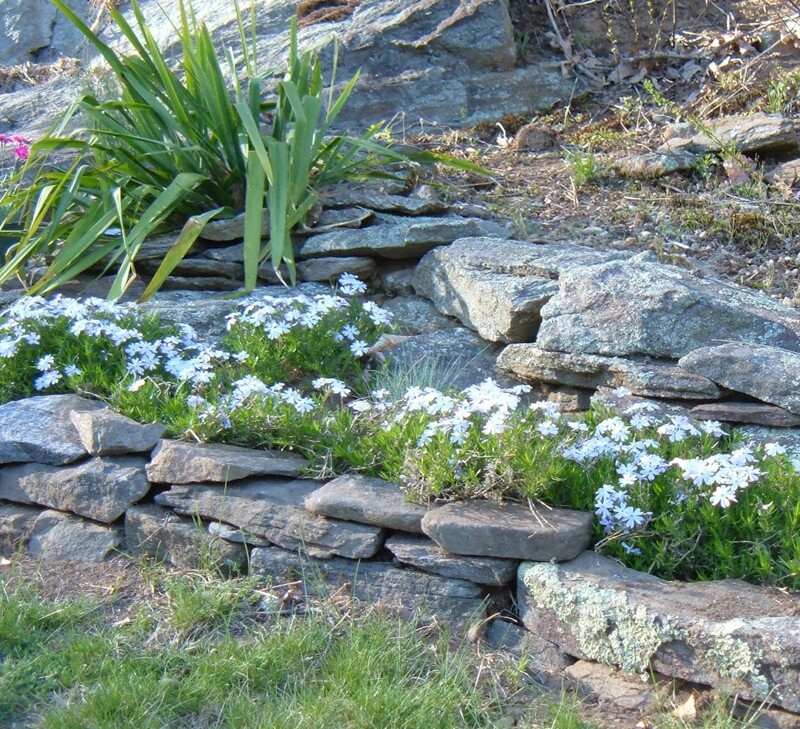 I'm reworking my stone borders for my planting areas this summer. Taking my time with it as my back and knees protest the project a bit. @ismeedee: That's right - I got a very expensive estimate from a landscaping gardener - about Â£2000 ($3000) to do all sorts of fancy things, including re-paving my front path, and using posh stone, far more than was necessary. I just decided to go it alone in the end. Well, you've inspired me. Our front flowerbeds need to be done. Maybe I need to "just do it," although I need someone to do the initial dirt work, too. Yours is gorgeous! The photo you have under the title, "This Design is so Simple You could Do It Yourself" is wonderful! I want to just sit there and enjoy it. This is a beautiful lens. You have created a very pretty garden. Good work! I thoroughly enjoyed this visit and reading about how you designed your gorgeous small front garden. It is so beautiful. Now, I am ready to get out and play in the dirt. Beautiful garden! Shows you can make a little bit of paradise with just a small space and not so much money! 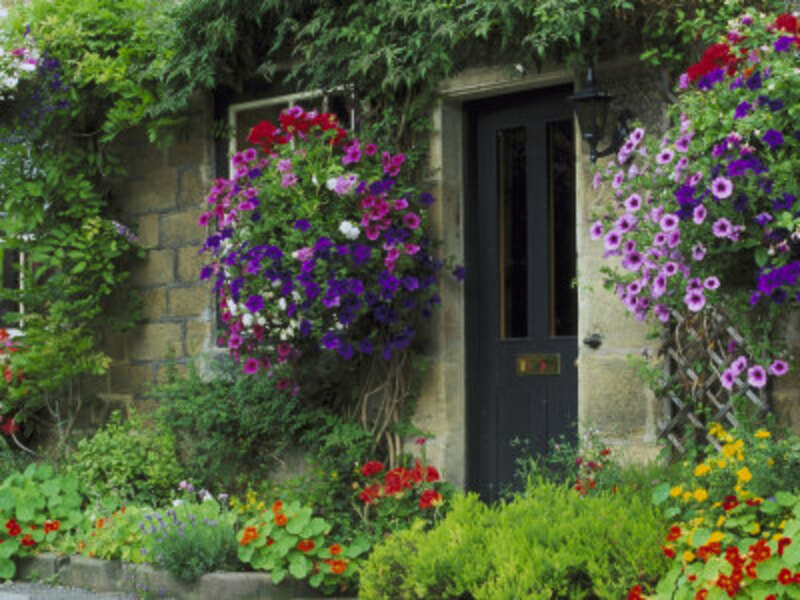 Your front garden turned out beautifully! It looks so welcoming and I love the variety of colors and plants. You did a wonderful job! Such an inspiration, thank you! I love to garden and have done so in such diverse places as Kansas, New Hampshire, Texas, Maryland, Florida and Alice Springs, Australia. Sure learned a lot over the years. 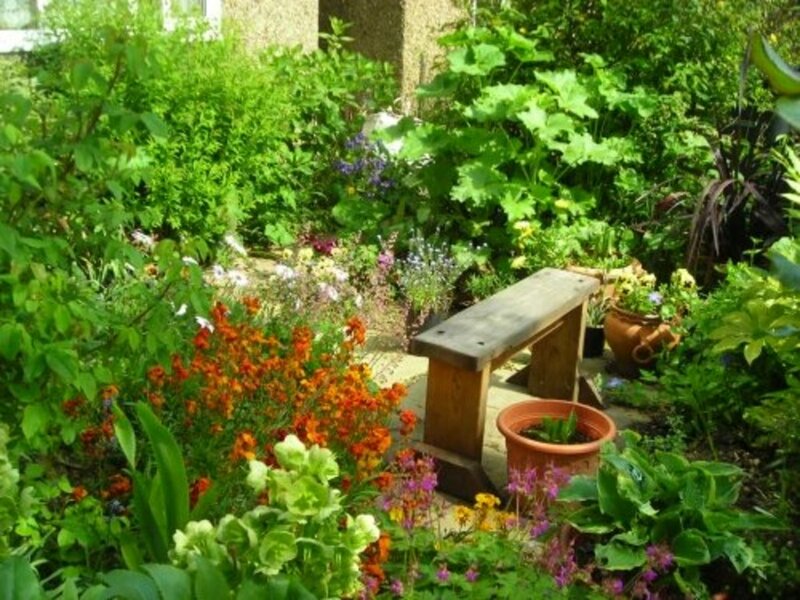 You've done a marvelous job with your space and I'm blessing it and lensrolling it to Create a Cottage Garden and will feature it on You've Been Blessed. What a beautiful garden &amp; great pics too! Thanks for sharing, you make it sound easy and fun too. Great garden. I'm in a flat now so don't get the chance to garden. Your garden looks lovely. You did a wonderful job. Lovely garden. The crocosmias are particularly pretty! @GramaBarb: Thanks for your Blessing - makes me feel I've done a worthwhile job! 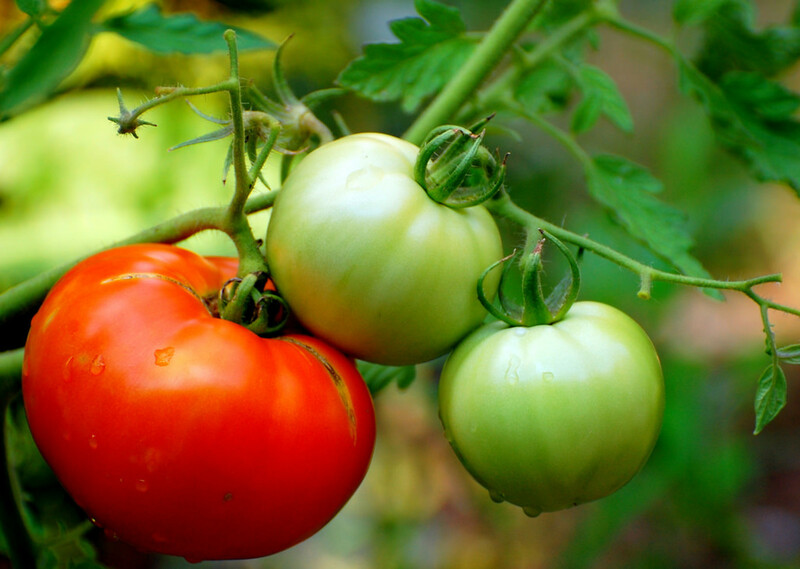 Loved reading your small garden planning tips! SquidAngel blessed! Absolutely gorgeous! I'm working on my dingy back yard at the moment so I figure it'll be lots of moss and ferns for me!